Addis Ababa, Ethiopia, 15th April 2019: Amb. 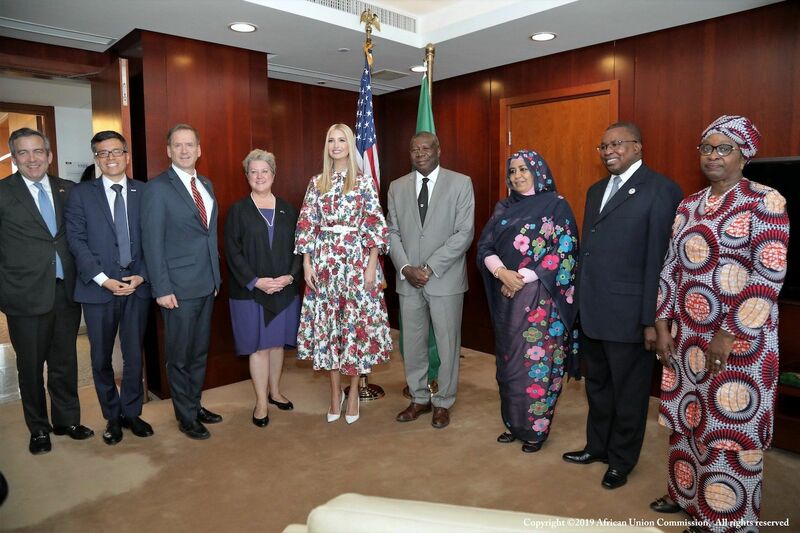 Kwesi Quartey, Deputy Chairperson of the African Union Commission (AUC), received Ms. Ivanka Trump, Advisor to the President of the United States of America (USA) and USAID Administrator Mark Green, at the African Union Headquarters in Addis Ababa, Ethiopia, to deepen the Strategic Dialogue between the African Union Commission and the United States. Both sides expressed a commitment to strengthen the collaboration between the AUC and the U.S. within the existing Cooperation Framework as outlined in the 2018 High Level Dialogue held in Addis Ababa, on 29th November 2018. The two high officials specifically reaffirmed the United States’ and the African Union’s unwavering commitment to advance women’s economic empowerment and entrepreneurship across the continent by promoting opportunities for women’s participation in the work force, increasing women’s access to finance, trade, employment, education, and skills development. The two also pledged to combat scourges including child and forced marriage, human trafficking, and sexual exploitation and abuse. Both sides further reaffirmed their commitment to shared values such as equality of opportunity, respect and promotion of women’s rights as well as ending all forms of gender-based violence and abuse in all spheres of life. In this regard, the Deputy Chairperson briefed the U.S. delegation on ongoing AUC-led initiatives on Gender Equality and Women’s Economic Empowerment including the adoption of the first AU Strategy for Gender Equality and Women’s Empowerment (2018-2028), the Continental Results Framework for monitoring and reporting on the implementation of the Women, Peace and Security Agenda, the AU Funds for Women’s Economic Empowerment, and the AU Campaign to End Child Marriage as enshrined in the AU Agenda 2063 priorities. The Deputy Chairperson further highlighted the importance of building bridges between the African Diaspora and US businesses with a particular emphasis on women entrepreneurs. On its part, the US delegation informed the AUC of the White House-led Women’s Global Development and Prosperity (W-GDP) Initiative aimed at empowering 50 million women across the developing world by 2025, and the OPIC 2X Africa Initiative which seeks to mobilize $1 billion in investment towards providing women in Africa access to finance, high-quality jobs, and critical services. The AUC expressed appreciation to the United States for its various support including to the AUC Departments of Social Affairs, Trade and Industry, and the Office of the Chairperson’s Special Envoy for Women, Peace, and Security. Recognizing the shared commitment to Gender Equality and Women Empowerment, the two high officials reaffirmed their willingness to promote effective laws, policies, and institutions, working closely together towards achieving those objectives. Conscious of the quality of their collaboration, the AUC and the US agreed to work closely together to enhance their strategic partnership to advance gender equality, women’s rights, women’s economic empowerment and entrepreneurship continent-wide. Preceding to the visit of the AU HQ, the Advisor to the President of the United States of America (USA) attended the launch of the OPIC2X Africa Women’s Initiative which took place in the United Nations Economic Commission for Africa (ECA) in the presence of the President of the Federal Democratic Republic of Ethiopia, Sahle-Work Zewde, and the ECA Deputy Executive Secretary for Knowledge Delivery, Ms. Giovanie Biha. Also present at the meeting from the AUC side were Madam Amira Elfadil, Commissioner for Social Affairs, Amb. Albert Muchanga, Commissioner for Trade and Industry, and Madam Bineta Diop, AU Special Envoy on Women Peace and Security. On the US side were Mark Green, Administrator of the United States Agency for International Development (USAID), and David Bohigian, Acting Chief Executive Officer, Overseas Private Investment Corporation (OPIC). The United States launched the Women’s Global Development and Prosperity (W-GDP) Initiative in February 2019 by signing a National Security Presidential Memorandum. The initiative will ensure women around the world are empowered and have the resources needed to meaningfully participate in, contribute to, and benefit from economic opportunities. The W-GDP Initiative aims to support women in the economy around the world to help them thrive in the workforce, launch businesses, and create value for their communities. Through this Initiative, the Unites States will aim to reach 50 million women across the developing world by 2025, boosting global gross domestic product and advancing peace, security, and stability for all. W-GDP is the U.S. Government’s first integrated approach to global women’s economic empowerment across multiple U.S. Government departments and agencies. The initiative is focusing on three critical pillars for women’s economic empowerment: workforce development and skills training; entrepreneurship and access to capital; and the overall enabling environment of policies, laws, and social norms that affect women’s economic participation.